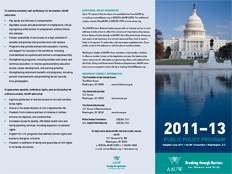 The American Association of University Women’s Public Policy Program underscores AAUW’s mission of advancing equity for women and girls through advocacy, education, philanthropy, and research and speaks to women’s needs, aspirations, and concerns across the life span. The work of AAUW builds upon more than 130 years of responsible public participation, and the following principles provide a basis for AAUW members’ actions at the local, state, national, and international levels. Implicit in each of our principles is support for government agencies administering programs, including adequate appropriations, effective and accountable administration, and provision for citizen participation. We advocate public discussion to ensure enlightened decisions on these principles. We work to increase the number of underrepresented populations, including women, in policy- and other decision-making positions. AAUW is committed to working in partnership with diverse allies and coalitions to break through educational and economic barriers for women and girls. AAUW does not endorse any candidate running for public office, nor any political party. However, AAUW members frequently provide expert and interested party testimony at legislative committee hearings, school board meetings, and other forums at which the issues being discussed are related to AAUW’s mission. AAUW members are also active in voter registration drives, voter education efforts, panels, committees, seminars, letter-writing campaigns, and virtually every other means by which citizens can participate in the democratic process.